"Monument" is also available through Bandcamp below. along with some great bundles. All Merchandise Originates from the United States. PHYSICAL CD's ARE SOLD OUT! 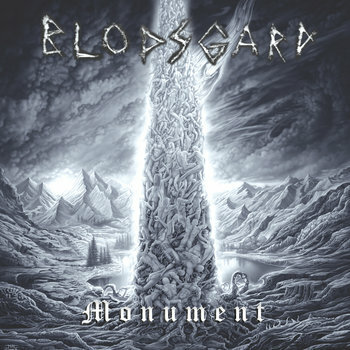 However, the "Monument" CD and other Blodsgard merchandise may still be purchased from Neseblod Records in Oslo, Norway located on the grounds of Euronymous' famous "Helvete" and currently housing an amazing musical archive. Visit them in person or by mail order. Some physical CD's are still available from The Oath. Front has organic Blodsgard logo. 1-1/4" x 5-1/4" high quality Embroidered Logo Patch, white thread on black with sealed black thread edging. These high-quality decals are Die cut and the background color will be the color of the object you place it on. The adhesive is on the back side so it will stick to the outside of your surface. Made to withstand sun and weather for 5+ years. We are usually able to customize size or color for you, for a small additional charge. Email us for details. Not recommended for interior walls (may damage paint). We CAN, however, customize for interiors as well using a different adhesive. Again, email us for details. Solve Et Coagula (2011) - SOLD OUT! Previously unreleased in physical format and available now only in extremely limited quantities. Nuclear Extinction (2008) - SOLD OUT! Released in an extremely limited physical format in 2008 and sold out. After repeated requests, now offered in digital format on our download page. Click HERE to purchase for 9.99. Item will NOT show up in checkout on this page.